This is a fantastic book -- well researched, exceptionally written, and artfully compiled. In addition to all that, it is a joy for the eyes and hands! We love the beautiful, crisp photography and durable, satin pages this book offers for a delightful read. Right up our alley too! The Herbal Apothecary incorporates traditional use and scientific information. You will love the wealth of information on growing and foraging these healing plants. There are plenty of recommendations for plant-based formulations to fight common ailments too. 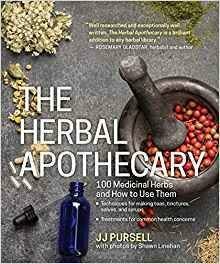 Step-by-step instructions show you how to make your own teas, salves, capsules, tinctures, and other essential herbal remedies.